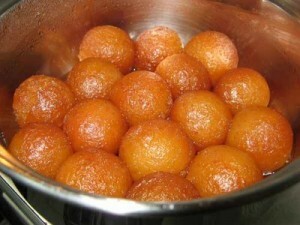 Easy Gulab Jaman recipe by Mariam at DesiRecipes.com. Milk balls dipped in sugar syrup and serve garnished with almonds or nuts of your choice. Take milk powder in a bowl. Add melted ghee to it and mix very well with hands. Add flour, baking soda, cardamum powder and mix again. Now add 3 Tbsps of very cold water and knead with hands until a smooth dough is formed. Make small balls of this dough(about 3/4 inches in diameter) and leave for some time. Take sugar in an other pan, add equal amount of water and boil for some time(prepare aik taar ka sheera). Deep fry all prepared balls(gulab jaman) until they become brown. Place them in sugar solution(sheera). Dish out and garnish with crushed almonds . They are now ready to be seved. how much melted ghee should added in dough????? how much melted ghee do you add? It was awesom..!! n thnx for updating..! !